Experience the bliss of connecting with the Earth and come alive! WHEN: JANUARY 25-30th, 2013 *REGISTRATION CLOSED. Please check back for future retreats. Join best-selling authors Michael Sandler and Jessica Lee on Maui for the experience of a lifetime. Spend 6 days and 5 nights, getting grounded and centered through barefoot running, outdoor yoga, and tranquil mountain and seaside meditations. You’ll come away revitalized and quieter of mind, looking and feeling healthier, stronger, and more vibrant than you have in years! 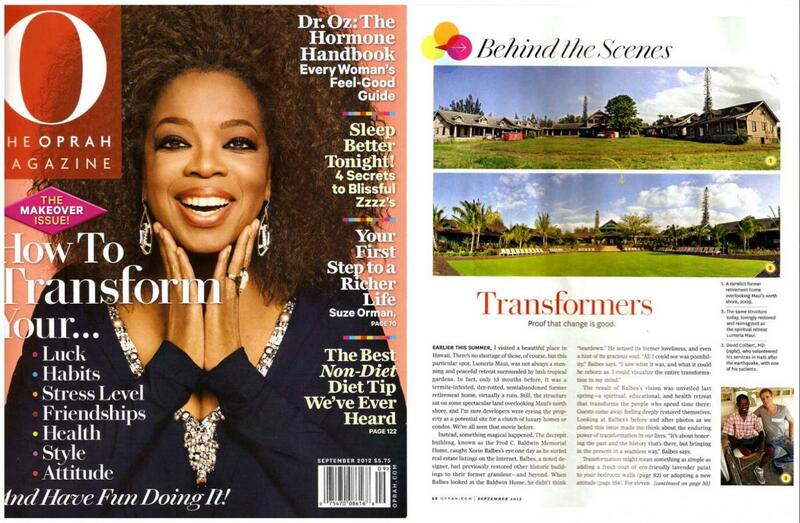 Escape to Lumeria Maui, a luxurious retreat sanctuary featured in Oprah Magazine. 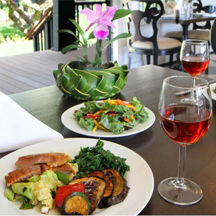 Enjoy 5-star accommodations and world-class organic cuisine, while relaxing on 6 secluded acres overlooking magnificent views of the island & the Pacific. Enjoy amazing daily runs, walks, and hikes, plus daily outdoor yoga and meditation, all on some of the most exotic locations on earth. Picture breathing in refreshing, ionized air and feeling your body and mind relax as we weave through old growth forests. Feel the healing Hawaiian clay beneath your feet as we hike along a mountain ridge, overlooking jungle ravines below and mist-clung rain forests above. Feel your body and spirit come alive as we watch a sunrise from above the clouds, on a 10,000 foot volcano. And feel the cells of your being vibrate, as we resonate together and recharge in harmonic meditation, inside a volcanic dome. The connection between running and yoga starts with your feet. Growing a stronger connection with the earth strengthens your stride, improves your balance and stability, helps keep you injury-free, and gives you a greater sense of peace and joy. 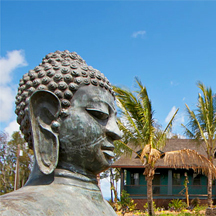 Gain greater flexibility and peace, as you practice yoga on a hillside, overlooking the ocean thousands of feet below. And experience the pure joy of feeling like a kid again, dancing and playing in the woods, through our own NaturePlay™ obstacle course. Throughout the retreat, you’ll experience the phenomenal spiritual and healing benefits of earthing, the process of electrically grounding yourself by getting in touch with the earth. Studies show you’ll find yourself stronger, more energized, and quieter of mind, with healthier joints, lower inflammation, decreased stress, and better sleep, all by connecting with the earth. Michael Sandler attributes his healing from a near-death accident to going barefoot and this very phenomenon he teaches about at this retreat. Finally, close each day by experiencing the most peaceful sleep of your life, in the comfort of an Earthing™ bag or “cocoon”, clinically shown to improve your health and well being. These are just a few of the memorable moments you’ll experience on this life-changing body, mind and earth adventure. REGISTRATION CLOSED. Please check back for future retreats. 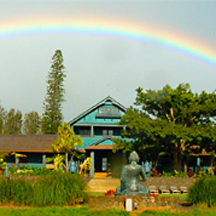 As featured in Oprah Magazine, LUMERIA MAUI is a luxury educational retreat center and stunning oasis of tranquility that connects people with the sacred 'aina (earth) and mystery of Maui. Lumeria is located on six magnificently landscaped ocean view acres, just outside of the seaside village of Paia on Maui's North Shore. The 1909 historic building was completely restored by award winning designer and author of 'SoulSpace', Xorin Balbes and features 24 luxurious guest accommodations. In your free time enjoy yoga classes, spa treatments, waterfall hikes, beach time at one of Maui’s many gorgeous beaches, surf or stand-up paddle lessons, snorkeling, and local shopping. - Free time to rest, rejuvenate, and process. Enjoy spa services or explore on your own. Early Bird Registration (by November 30th): SAVE $200! - 1 RunBare Stretching Kit including a foam roll & inflatable ball. - 1 copy of Earthing: The Most Important Health Discovery Ever? If you have questions, please submit a contact form. Earthing™ is a registered trademark of Earth FX, Inc.